Xenotransplantation: Can pigs save human lives? 122,621 people in the United States are currently eligible to receive a transplanted organ, but only about 30,000 transplants are performed each year due to a shortage of available organs. As a result, approximately 22 people die each day waiting for a transplant (1). One exciting area of research, xenotransplantation, aims to increase organ availability by using pig organ donors. It sounds like science fiction, but new technological advances mean that xenotransplantation may become widespread in the near future. Organ transplantation is a treatment option for people who have end-stage organ failure that can’t be controlled using other treatments. Globally, the most commonly transplanted organs are the kidneys, followed by the liver, heart and lungs. In 1954, the kidney was the first human organ to be transplanted successfully (5). Liver, heart and pancreas transplants were performed by the late 1960s, while lung and intestinal organ transplant procedures were not successful until the 1980s. Unfortunately, the frequency of transplantation is severely limited by the availability of organs. While kidneys can be transplanted from living donors, other organs come from deceased donors. Since there are more patients awaiting a transplant than organs available for transplantation, the transplant waiting list has been growing exponentially for years. The graph below shows the gap that exists between the waiting list and organs available for transplantation. Figure 1: Limited organ availability. Graph summarizes the paucity of available organs over the years (green) and the limited number of transplants performed during those years (red line) in the United States. 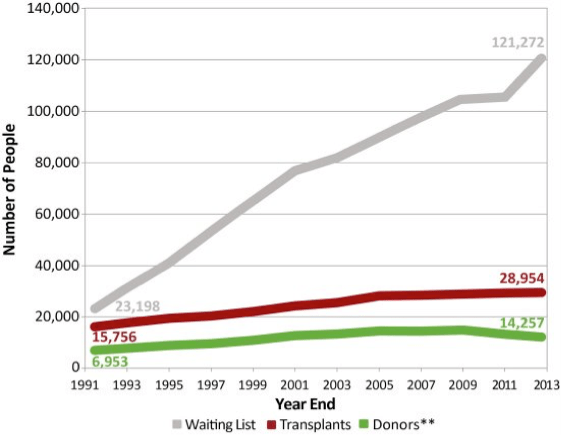 An exponential increase of number of people requiring organ transplantation is shown in the grey line. Data from (1). Transplantation is one of the most challenging and complex areas of modern medicine. One major obstacle is transplant rejection, when the body recognizes the transplanted organ as foreign or non-self and mounts an immune response against it. This response can lead to transplant failure. The risk of transplant rejection can be reduced, but not eliminated, by the use of immunosuppressive drugs. Transplant patients remain dependent on these drugs for the rest of their lives. Unfortunately, these drugs have multiple negative side effects, including higher rates of cancer and infections. How can we increase the number of organs available for transplant? Organ regeneration and bioengineering represent two potential solutions and are areas of intense research. Another, perhaps more attractive solution, is the use of pigs as organ donors. Since pig organs are similar in size and physiology to human organs, they are good candidates for transplant and would be readily available when needed. The concept of cross-species (pig-to-human) transplantation is known as xenotransplantation, and the transplanted organs or tissues are called xenografts. The first xenograft heart transplant in a human was performed in 1964, using a chimpanzee heart (2). Thomas Starzl carried out the first chimpanzee-to-human liver transplantation in 1966, and in 1992, he performed a baboon-to-human liver transplant. In each of these cases, the survival of the xenografts was short due to graft rejection. Immunosuppressive drugs were not enough to prevent an immune response against the xenografts. Such difficulties have continued in xenotransplantation trials. The immune response to a xenograft is generally more extreme than that seen in same species transplantation, and it ultimately results in xenograft rejection, or in severe cases, recipient death. Pigs have molecules on their cell surfaces, including sugars and proteins, that humans do not have. When pig organs are transplanted into humans, the immune system recognizes these molecules as non-self and begins to attack the pig tissue, leading to immediate rejection of the organ. In addition to these completely different molecules, because pigs and humans are genetically dissimilar, some of their proteins that serve similar functions have slight differences that also trigger an immune response. Unfortunately, not even the immunosuppressive drugs can control the rejection driven by the tissue incompatibility between pigs and humans. If we could eliminate the pig proteins that humans don’t have and introduce necessary human proteins in the pigs via genetic engineering, then the chances of rejection could be minimized. The creation of such genetically modified pigs could solve the problem of organ availability. In 2002, scientists reported the generation of a cloned, genetically modified pig lacking a sugar molecule that normally stimulates a strong immune response. Since then, pigs containing many human genes that can help the pig immune cells interact successfully with human immune cells have been generated and their organs have been tested in pig-to-non-human primate transplant models. The use of these modified, or transgenic, pigs as organ donors can help prevent the recipient’s immune system from immediately rejecting the xenograft. The transplantation of hearts and the kidneys from these transgenic pigs has already greatly improved the survival of xenografts in non-human primates. Today, a pig kidney may last for months, and a heart can survive for multiple years. However, the primate recipients are still dependent on immunosuppressive medications to control the immune rejection. 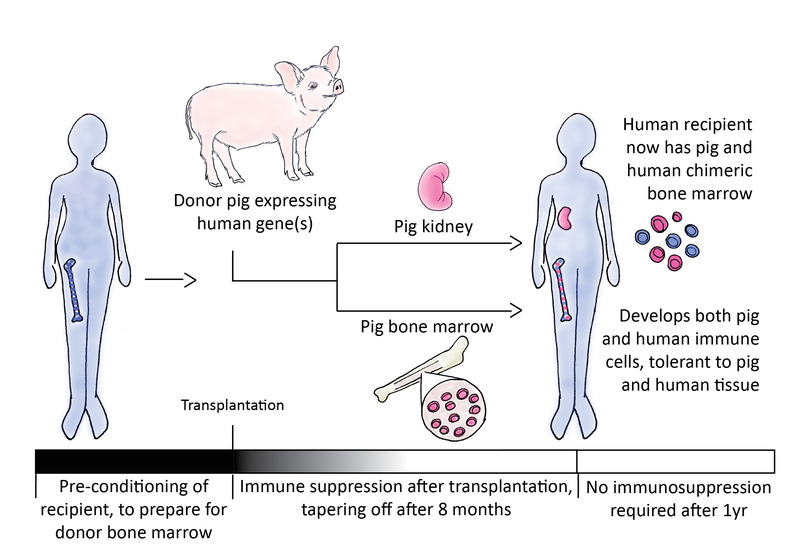 Another exciting strategy in xenotransplantation is the tolerance approach, which tricks the recipient’s immune system into recognizing pig molecules as self by administering pig bone marrow cells to the recipient prior to organ transplantation. Donor bone marrow contains progenitor immune cells that can subsequently develop into mature immune cells in the recipient’s body. These donor immune cells in the recipient will not attack the transplanted organ, because they recognize it as self. This method was first used successfully in human-to-human transplantation clinical trials at Massachusetts General Hospital (3). Patients who received donor bone marrow with a kidney transplant became tolerant, meaning that no immunosuppression drugs were required for the transplanted kidney to function even one year after the kidney transplant. Scientists are currently studying tolerance in a well-established pig to non-human primate xenotransplantation model. Figure 2: The strategy of tolerance via bone marrow transplantation. Before transplantation, the recipient undergoes pre-conditioning to make room for the incoming donor bone marrow cells. An organ is transplanted at the same time as donor bone marrow. At first, the recipient is put on immunosuppressive drugs so that the donor bone marrow cells don’t get rejected. Donor immune cells are monitored for signs of immunoreactivity against the transplanted organ. Once these tests show no immunoreactivity, the recipient can reduce the amount of immunospressive drugs that they are taking. Organ function is monitored until complete medication withdrawal of is achieved. Humanized pig transplants still require the use of immunosuppressive drugs, but scientists believe that the tolerance approach will allow xenograft survival with minimal or no immunosuppression. In a pig-to-baboon tolerance model, transplanted pig skin was maintained for over 2.5 months without immunosuppressive drugs (4). These results demonstrate for the first time that pig bone marrow transplantation may benefit a primate xenograft recipient’s immune system by reducing organ rejection. If this effect holds true for kidney or heart xenografts, it will represent a major milestone in xenotransplantation. Within the past decade, xenotransplantation research has made a great deal of progress, moving closer to potential clinical applications. The combination of genetically modified pigs, tolerance protocols, and effective immunosuppressive medications has already helped to reduce the extreme organ rejection witnessed in early xenotransplantation. Although transplant biology remains a challenging field, xenotransplantation has the potential to help doctors provide transplants to more of the many waitlisted patients who desperately need them. Aseda Tena is a PhD candidate in the Biological and Biomedical Sciences (BBS) program at Harvard University. 4. Tena, A. et al. “Prolonged Survival of Pig Skin on Baboons following Administration of Pig Cells Expressing Human CD47”, submitted in Am J. Transplant. September 2015. Feature image: “2009-07-19 056 a Mountian View Obon” by Flickr user mnorri. Licensed via Creative Commons. Even with all of the issues that come along with the xenotransplantation of pig organs, the use of porcine tissue in the biomedical research industry has led to a number of big breakthroughs, even in the last few years. Scientists are constantly finding new ways to utilize cells, tissue, organs and other parts from research swine to research how we might find new cures for diseases and ailments found in humans. A direct transplant may not be an ideal solution right now, but in a few years we will see the advent of new transplantation technologies thanks to the research that is being done in the biomedical field.